15 years, that’s a really long time. I was in the 3rd standard when Shiela Dikshit took over Delhi and since then, she has been the face of Delhi for me. So what can one do in 15 years? According to Mrs. Shiela, elections are won in the last 15 days (as we can see how the political parties have united against AAP). So if 15 days is what the public memory is all about, then who cares about the 15 years? 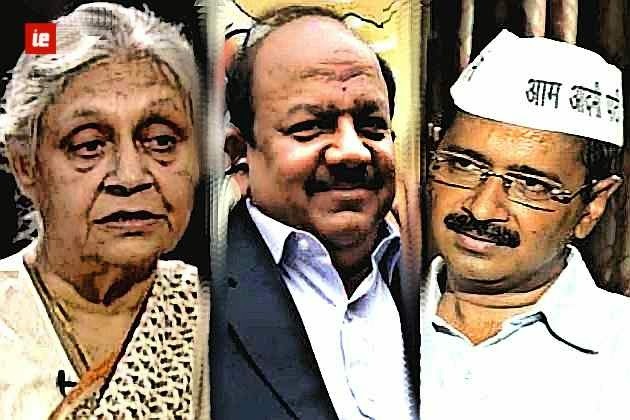 But, now it is time to dig into the so called achievements of Mrs. Shiela Dikshit who thinks that the Aam Aadmi is a fool and can be taken for granted. 1) During the last 15 years, the government has managed to open somewhere close to 15-20 hospitals with an average bed capacity of 100-200 beds. The international standard states the availability of 1 bed per 1000 citizens. Sadly, and it really is very sad, the ratio in Delhi is not even 1 bed to 15000. 2) To fill the void, private hospitals were opened. But really, how many in Delhi can afford a consultation fee of 300-500 per visit to a small clinic? In short, no check on private hospitals. 3) Dengue, Dengue everywhere, but where are you Mrs. Shiela Dikshit? Hiding inside your house and blaming MCD? Do you have commission from mosquito repellent companies as well? 4) Can you please explain why your own party members never go to government hospitals? Is the Aam-Aadmi untouchable or do you not trust your doctors? Or are the hospitals way too unhygienic? 5) Your every manifesto since 1998 promises full statehood for Delhi. The Congress is in power at the center, are you waiting for the BJP to win the Lok Sabha elections to ask for Delhi’s statehood? I don’t care whether Delhi is a state or not, but I want you to shut up and stop giving the same excuse whenever something goes wrong in Delhi. 6) You gave Delhi a chance to establish itself as an International city by hosting the CWG Games. I was a volunteer, but more more importantly, I was an ashamed Indian. Should we, the citizens of Delhi, forgive you so soon for embarrassing us Internationally? 7) So the stadiums were not under you, that’s alright. But the stadiums were in Delhi, the games were in Delhi, the falling bridges were in Delhi, the war-ravaged under-construction city at the time of Commonwealth Games WAS DELHI. Didn’t you ever feel ashamed of yourself for this blunder? 8) The budget for CWG Games was 70000 crores and which is equal to Delhi’s Health and Education budget for the last 8-10 years. While bidding for the games, did you take these facts into account or were you so dumb that you thought that 0 does not have any value and the cost of the games was Rs. 7? I can write indefinitely on the CWG Games, but lets move on now. 9) There are 923 government schools in Delhi for a population of 16 million. The schools are already doing double shifts. Are you planning to to have night shifts as well in schools since your statement says that you can not ‘provide space for schools’? 10) The major migration and expansion of Delhi has been during the last 15 years. “No space for schools and hospitals”, does it not clearly show how pathetic your planning has been for Delhi? 11) The annual session in schools begins in March, but the students do not get books and uniforms till July. Your department says that the books have not been ‘printed’. The same books are ‘bought’ by private school students in March itself. Can you explain how this happens? Would you send your grandchildren to school without books? Or, would you EVER send your grandchildren to any government school? Forget studying, can they spend even a single day in a government school? 12) Your budget distribution says 6600 crores were spent on education in 923 schools. Unfortunately, I do not have the time for RTI queries, because I can see a lot of anomalies in these stats. 13) While there are billions of development failures to point out, can you explain why the heart of the city, Connaught Place, has missed it’s reconstruction deadline by 4 years? I remember how during the CWG Games the cranes and incomplete construction were covered with curtains. Please do not say it’s because the NDMC is not under you. 14) During the last 15 years, only 2-3 medical colleges have been opened in Delhi. Wow, that really is an achievement because anyway we do not have hospitals to provide them with jobs! 15) You say that Delhi does not have enough water. How do you know that because the DJB does not even have any proper meters to measure the inflow of water in Delhi. Also, nobody has ever died of thirst in Delhi thanks to your ‘Tanker Mafia’. A very big thank you for saving Delhiites! 16) If you can not provide water in Delhi in 2013, what will happen 5 years from now? I’ve already decided to pack my bags Mrs. Shiela! 17) The most painful of all is the way you have handled security. Nirbhaya is the prime example of your misrule and your blatant casualness. If the CM, being a woman, says she is helpless, then could you please get lost from Delhi? 18) In 15 years, you have regularized thousands of colonies. But maam, why did you let these colonies to get established? Wasn’t it your duty to develop Delhi in a planned manner and provide proper housing to all these people who were forced to buy property in such areas? Because of your policy failures, it is the common man who always suffers. And, then you use this for gaining votes. Good. 19) You’ve spent unaccountable crores on cleaning the Yamuna. My question is, did you clean Yamuna, or did you clean away the money meant for Yamuna? The nallah near my house smells better than your clean Yamuna. I’m not a Narendra Modi fan, but here, we need to learn from the Sabarmati Riverfront in Gujarat. Do you need another 15 years? Could Delhi have become the next Shanghai, or are is that expecting too much? But whatever be your work during these 15 years, it really is below par. The present rate of development (and we are not talking about GDP here) will only place Delhi as an international city in the next century. You seem immortal, but i can not wait so much.